Why do dogs lick people so much? Sometimes, you almost wish you hadn’t asked the question. For those of a sensitive disposition, it’s fine to remain in the happy hinterland of thinking you dog’s licks simply mean they love you. But for those with a more inquiring nature, here are 7 too-much-information explanations behind the real reasons for dog licking. 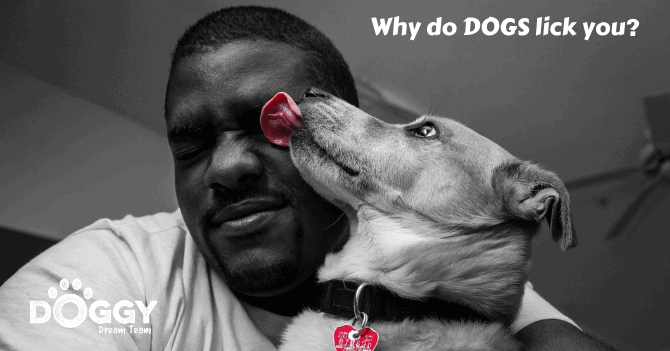 Why do Dogs Lick? Mother Nature…With a Twist! Why does my dog lick me so much? Dogs are programed to lick and use their tongues as a tool. Indeed a mother dog licking her puppies has a very practical purpose. For starters, licking stimulates newborn puppies, encouraging them to take their first breathe in the world. Then, when the pups are older the repetitive action on tongue on fur, improves the blood circulation to the puppies skin, conditioning their coat and keeping them in good order. But licking also removes odours, which plays an important role in keeping vulnerable puppies safe in the nest. Ahem, hopefully your dog isn’t judging your personal hygiene…but it’s a thought. An even more unsavoury thought is how mother dogs lick their puppies as a signal it’s time to empty their bladder and bowels! This is because puppies under two weeks of age are not able to ‘Go’ by themselves. Mother Nature designed them this way to prevent the puppies soiling the nest and drawing the attention of a predator. As a safeguard, she devised a system whereby the mother licks their rear to stimulate toileting…and then deal with the output! Nope…we didn’t say a word. Why Do Dogs Lick Lips? That big slurp of a welcome-home lick, right on the kisser. Yewh! Actually, this is plugging into another puppyish behaviour. You see, puppies lick their mother on the face and especially the lips, to prompt her to feed them. When a mother dog has all those maternal hormones sloshing round her system, she has a strong regurgitation reflex. Her puppies trigger this urge to purge when they lick her lips. This is part of the weaning process. The hungry pups give mum a big welcome home lick and they get a partially digested meal as a reward. Again, we’re keeping tight lipped about this one. Why Do Dogs Lick Noses? Is your dog a nose licker? The thing with licking noses is the dog tends to lick from bottom to top, which is tickly on the nostrils and not the pleasantest sensation in the world. So why do they do it? Yes, your dog is likely to be making a genuine show of affection, but there is a deeper subtext. So the your nose-licking hound may actually be trying to reassure you that they are a big softie after all. Which presumably they are, otherwise you wouldn’t still have a nose as it would have been bitten off by now! Why Do Dogs Lick Hands and Feet? Feet licking and licking skin in general is about reading your mood. We’re talking pheromones here, those natural chemical messengers that your body gives off. For example, if you are very stressed the levels of cortisol go up and this causes changes in the chemistry of your skin. By sampling your skin, the dog can read these signals, much like checking your text messages. That is unless you’ve been cutting up prime steak and not washed your hands…in which case the dog licks because you taste scrummy. However, the dog isn’t tasting the pheromones with their taste buds. No, they use the tongue as a way of transferring a sample from your skin to their vomeronasal organ (also known as the Jacobson’s organ). The vomeronasal organ is a sensitive detector that is highly developed in dogs and, almost like an extra pair of eyes, gives them lots of information about the world around them. But talking of tastes, yes, dogs do lick to find out where you’ve been. 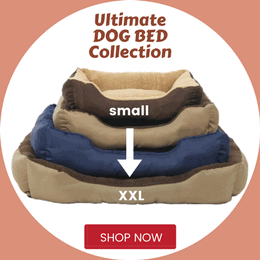 Remember how your puppy used to put everything in their mouth, from stones to memory sticks? Well, this is about learning via the mouth, which is what dogs are programmed to do. If you’ve been somewhere different and the dog starts licking your skin, what they’re doing is taking taste samples of the molecules deposited on your skin. They use those tiny taste molecules to build up a mental picture of where you’ve been. Some dogs lick instead of bite! A litter of pups are always play biting and playing rough and tumble. When a puppy bites too hard their playmate yelps and the game stops for a while. This is a behaviour we encourage, as it teaches the dog to become soft-mouthed. Some owners do such a good job of teaching their pup bite-inhibition, that the dog turns to frenzied licking when excited…instead of biting. You Taught the Dog to Lick! This is more common than you might suppose. What do you do when the dog launches a lick attack? The chances are you laugh and push him away. Well, to a dog this is wonderful attention. The whole premise of modern training methods is reward-based. This means when a dog does something and is rewarded (with a treat or attention) they become more likely to repeat it. This could explain why the dog fixates on licking one (particularly giggly) family member, over another more stoic one. Dog licking behaviours can become obsessive-compulsive. This is because licking releases natural endorphins into the dog’s bloodstream in a similar way that a child sucking their thumb feels safe and reassured. A dog that licks too much, especially themselves, can cause harm. An example of one such problem is a lick granuloma. These are raised sores that arise from constant licking, and commonly become infected. If your dog is an obsessive licker, then get them checked by a vet. They may either be feeling stressed or have a medical problem. Slobbers and slurps, doggy people!